Clariant, a world leader in specialty chemicals, presents the very latest in renewable-based waxes combining demand for more natural, sustainable products with state-of-the-art performance at European Coatings Show 2013. Its new Ceridust® micronized wax innovations for wood coatings, powder coatings and printing inks are based on renewable raw materials. They support customers’ ambitions to offer sustainable solutions to the consumer and industrial markets without compromising on quality. New Ceridust 8090 TP makes it market debut before ECS visitors. The revolutionary additive for wood coatings creates a protected and smooth, soft-touch surface with the pleasant feel of untreated wood. The micronized wax increases coefficient of friction in combination with outstanding scratch resistance performance, particularly in water-based formulations. Presented for the first time in Europe, Ceridust 7820 TP is ideal for usage in high-gloss applications, offering high performance degassing effect in various powder coating systems and achieving high quality surfaces. At high wax concentration Ceridust 7820 TP shows almost no matting. In addition, when used at a 2% dosage level, it virtually eliminates pinholes without reducing the gloss level. New Ceridust 8330TP is a partly-renewable polymer wax for printing inks. It offers an ideal combination of flexible yet tough polymeric characteristics, rendering it a powerful rub-resistance additive for all ink systems, and can be used with both liquid and pasty inks. Ceridust 8330 TP has been tested and approved on the largest-scale printing machinery. 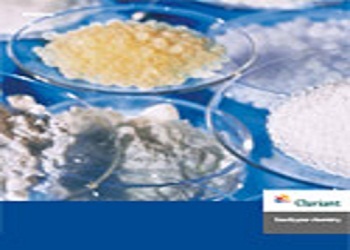 The renewable source-based waxes extend Clariant’s range of reliable, and highly-effective Ceridust wax products and solutions regarded as the benchmark for performance surface modifiers. To meet fast growing demand from the plastics, coatings and ink industries, Clariant recently announced the installation of new micronization equipment at its site in Gersthofen, Germany to expand output by a further 15%. The addition of the new equipment makes Clariant’s Production Plant for Micronized Waxes one of the largest wax micronization units worldwide. “Clariant’s new Ceridust waxes are bringing to life our commitment to the Performance.